For centuries, women have sought relief from the pain of childbirth. Until the 1800s, most women gave birth at home, with the help of other women and the local midwife. For the most part, women bore the pain of childbearing as part of their lot in life. Anaesthesia during childbirth became more popular in the 1850s, after Queen Victoria used ether during labour. In those days, anaesthesia meant using whatever drug would bring unconsciousness, and the dose was however much it took to achieve it. Nearly 70 years later, another type of anaesthetic became the choice for childbirth… twilight sleep. Twilight Sleep, or Dammerschlaf, as it was called by the German doctors who were using it in their clinic, was a drug which provided pain relief and also erased the memory of birth altogether. How Did Twilight Sleep Become Popular? Originally, Twilight Sleep was met with skepticism, and was not favoured by other physicians of the time, especially those in America. The dangers and severe side effects of the drugs used were cited as reasons why it should not be used during childbirth. Regardless, wealthy women travelled to the German clinic, attracted to the idea of ‘painless birth.’ Over time, the doctors who used it experimented, and refined their methods. The word got out, and in 1914, two American journalists went to Germany to report on it for a popular women’s magazine. The article described the luxury provided at the clinic, the compassionate doctors and, most importantly, how women slept through the birth. It was presented as a miracle discovery. This happened at the time of the Suffragette movement, and it set in motion a call to action for the early feminists in America. The National Twilight Sleep Association was formed, and began a concerted campaign, demanding that doctors in the US adopt the practice of Twilight Sleep during birth. The fact the drug had been rejected by American doctors for well over a decade was unimportant. Women were urged to rise up against the oppression of the male doctors who were withholding access to this miracle. Society women and some prominent doctors took up the cause, and before long the pressure of demand began to have its way. Huge public pressure, and the potential loss of clients, caused many doctors to offer Twilight Sleep. Hospitals quickly put together special maternity units, catering for women who wanted the drug. What Drugs Were Used In Twilight Sleep? Two drugs were combined to produce Twilight Sleep: morphine and scopolamine. Morphine is derived from opium. It was developed and first tested early in the 19th century, by a German pharmacist’s assistant. It acts on the central nervous system, causing pain relief. Scopolamine is a compound derived from nightshade plants. It causes patients to fall into a semi-conscious state and experience amnesia (inability to recall recent events). By using the right combination of these two drugs, women would fall asleep, and wake up unable to remember anything about the birth. For them it had been ‘pain free’ because they had no memory of the birth. Not remembering the pain of labour doesn’t necessarily mean there was no pain at the time. Scopolamine caused women to lose their inhibitions, and have no conscious awareness of what was happening to them. The small amount of morphine used didn’t prevent pain, but contributed to women becoming uninhibited, and even psychotic. Many women would thrash around, bang their heads on walls, claw at themselves or staff, and scream constantly. They would either be restrained on their beds, by their wrists and ankles, or put into straight jackets. Often blinded by towels wrapped around their heads to prevent injury, they would be put into ‘labour cribs’ – cot-like beds that prevented them from falling to the floor. They would remain on the beds, bound and screaming, often lying in their own vomit and waste, for as long as it took for labour to end. Babies were also significantly affected by the use of Twilight Sleep. The drugs would cross the placenta and depress their central nervous system. They would be born drugged, and unable to breathe normally. The commonly used image of babies being held upside down and slapped on the bottom comes from this time – when doctors would attempt to revive comatose newborn babies. The women who experienced Twilight Sleep in America probably didn’t have the same experience as the wealthy women who were treated in Germany. The German clinic had many successes – mainly due to the refined treatment program in place. A wealthy woman could stay at the clinic for a month before she was due, so the staff could work out the right dose of scopolamine for her particular physiology. When labour began, her doctor would stay with her, and monitor her from the first dose of Twilight Sleep, doing memory tests every 30 minutes, and adjusting the dosage, depending on her awareness of her surroundings. She would have coverings over the bed, and wear dark glasses and even earplugs, to avoid overstimulation. Afterwards, the new mother would wake up with no memory of the birth, and would remain in her private room for a month. This refined treatment protocol was rarely seen in any of the American hospitals. Doctors from the US would visit the German clinic, observe several births, then return to their practices at home. They were then regarded as ‘Twilight Sleep trained’, despite there being a recommended 3 year course to learn the technique properly. The sheer number of women demanding Twilight Sleep in America also caused many doctors to cut corners when implementing it, and sank the arguments of those who were against the practice. Doctors began to give the same set doses of Twilight Sleep to all women, rather than the personalised dosage given in the German clinic. Hospital nurses, who weren’t trained in the use of Twilight Sleep, observed the labouring women, and the doctor came in only when birth was imminent. Husbands were banned from the labour ward. Only medical staff witnessed the traumatic effects of the drug. In 1915, a year after the craze for Twilight Sleep began, Francis Carmody, one of the most prominent supporters of the drug, died giving birth to her third baby while under the drug’s influence. Her doctor and her husband denied the drug caused her death, but the demand for the miracle ‘painless birth’ dwindled. Even so, Twilight Sleep continued to be used on women well into the middle of the century, until women began to recall their experiences. Nurses and others who had witnessed the traumatic ‘painless births’ also spoke out, and an exposé was published in the popular Ladies Home Journal in 1958. These shocking tales of delirium, and women harming themselves, caused the practice to fall out of favour. By the early 1970s, it was no longer routine for women to be anaesthetised to the point of unconsciousness, while their babies were forcibly removed from their bodies by forceps. The natural birth movement was beginning, but the culture of birth had already been altered. Thanks to the advent of Twilight Sleep, birth was no longer the domain of women at home, but had come under the control of hospitals and doctors. Below is a short clip about twilight sleep, from the eye-opening documentary, The Business Of Being Born, which we HIGHLY recommend watching. 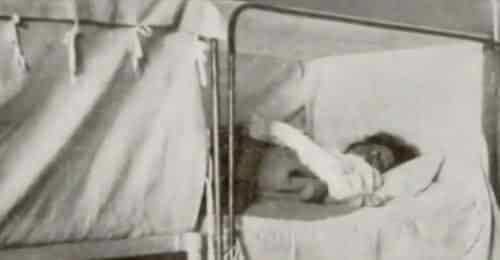 Recommended Reading: 10 Shocking Birth Practices From The Past. You might also like to read the book, Birth: The Surprising History of How We Are Born by Tina Cassidy. This is how I gave birth to my first child in 1966 with the drug scopolamine. I was married, 19 years old and afraid of being in the hospital, let alone giving birth. I asked my provider if he could just put me to sleep for the birth and he said, “Absolutely”. He did not tell me that I would, in fact be awake for all of my labor and be put under general anesthesia for the actual delivery. I had no memory of the birth itself but I was not allowed to hold my son for 48 hours after delivery because they said I could drop him due to the medication. My son had a severely molded head (a cone head) and a high pitched scream. The nurses laughingly called him “Squeaky Mouse”. I intended to breastfeed but they only brought him out of the nursery once every 4 hours for 30 minutes. Still I tried to nurse him. I could alway hear him coming because of his high pitched screams. My husband was not allowed in the room when the baby was there, only when the baby was in the nursery. We were in the hospital for a week for a vaginal birth. Several years ago, while I was taking an additional certification course as a childbirth educator, I had a sudden flashback and remembered parts of my labor. The memory brought me to tears. I was in a labor room with 8 other women in labor. I was in a stainless steel crib with the sides up – high metal bars. I was thrashing around and screaming uncontrollably. Even as I was screaming, I was thinking that I should not be screaming because I would upset the other laboring women. But I had no control over my actions. I can remember screaming my Doctor’s name and yelling, I want Dr. K…. The nurse can over and told me that the doctor was not there, that he had gone home. But I continued to scream because I could see his glasses on the window sill. That is still the only memory I have of that birth. But that memory was totally suppressed for over 40 years. But I will never forget the breastfeeding instructions I was given at discharge, “Do not breastfeed any more often than every 4 hours. The baby’s stomach needs to rest in between feedings. If the baby cries in between, give water. If that does not hold him, your milk is not strong enough”. Breastfeeding lasted less than a week after I got home. I went on to breastfeed all my other kids and I am now a childbirth educator and board certified lactation consultant (IBCLC). Oh im so sorry to hear about your traumatic experience. Oh Susan. I wish that I could give you a hug. Thank you so much for sharing. I am so grateful to women like you who are working in the field of obstetrics these days. I feel so embraced and listened to by my doctor, nurse, and doula. I am so, so sorry that happened to you. my mother is now deceased. I was born in 1962 and was also born during twilight sleep. After I was born I was not moving around much due to the anesthetic and the Dr. told my poor mother that I was retarded and had a brain injury. I often wondered how they got the babies out of the birth canal and it occurred to me that it was via forceps. I was 16 an unwed mother. My family doctor had arranged a private adoption. I was given twilight. I would sit up and down until my elbows had sheet rash. They brought me a bed pan and I climb over the big rails, put the bedpan on a chair, then I cleaned myself, climb back in the bed and put on the call bell, they never said a word. I was crying and wanted to see my aunt, the nurse said if I would stop acting like a baby and stop crying she would let my aunt come in. I beg my aunt to call the doctor, I couldn’t bare anymore. My son went to his adoptive home for three weeks. I was then notified he was not adoptable. because he was brain damaged and would be retarded. He could go into the system of foster care. I said NO, I brought him into this world and he is my responsibility, I was trying to place him in a loving home. He had forceps scars on his head for many years. BUT, PRAISE GOD, he gave him back to me and he was FINE. He was a BLESSING to OUR family and others. He got a college degree in Respiratory Therapy and has his own business. My next two son’s I had in later life were Natural Child Birth and I had actually worked in Labor and Delivery, so thing went very smoothly and was a WONDERFUL experience. In addition to the horrors of the birth, those breastfeeding instructions are unbelievable. No wonder breastfeeding all but disappeared for decades. Oh my goodness Susan, that’s absolutely traumatic. Thank you for sharing. I’m so sorry that was your birth experience. Thank you for all the work you do today with birth. You certainly have been a light of hope and knowledge for me; and you have helped me through my struggles with breastfeeding and the trauma of my c-sections through your birth education work more than you know. Thank you for all that you do. This is how they treated my mother when I was born, as well as two of my brothers; 1949, 1950 and 1951. She went 12 whole hours before holding her babies. When her final baby was born in 1965, she went natural, but even then she was not allowed to hold her newborn for several hours. When I gave birth to my 3rd child, it was a home birth (my 4th, as well.) My mother attended my 2nd and 3rd births. When she held her newborn grandchildren within minutes of their birth she broke into tears, stating she had never held an infant so young. I cried for her. Such a loss and all because of the “Do no harm” doctors. The beginning of the article states that U.S. doctors refused to perform this treatment because of the dangers and side effects. But the suffrage woman demanded it as if they had more knowledge than these male doctors who according to them only wanted them to suffer. This mentality aided in large part by the media glorifying this practice brought it here for decades. It became so popular and so many woman demanded it that an obgyn would go out of business if he did not perform it. Early on, doctors that spoke out against it were shunned and if it were today would be called sexist and/or misogynist. Doctors are not always right, but they know more about medicine than those not trained in it and do far more good than harm, and 99.99% of the time strive to do so. IWith medicine and especially new treatments there are always risks, but doctors do, with very few exceptions, abide by the Hippocratic oath. It’s only when outside forces such as this case or when the government steps in to play doctor, do we have such problems. I’d like to believe that there are now safeguards in place to prevent these sorts of things from happening, but unfortunately the same mentality that caused this is alive and well as is the government overstepping their bounds. I get the general point of what you’re saying, but do you feel that what was provided in the US was what women were demanding based on the German practice? I find it troubling that you are, essentially, blaming the women for this practice. Women weren’t demanding what happened. They should have been given the opportunity to view what it would be like. The article clearly states that the German doctors worked with their patients for months to figure out correct dosages, etc. American doctors trained for days and treated all patients as if they were the same and would react / need the same things. That was hardly what was being demanded. It would be an interesting study to research the effects of a twilight birth on the baby. Does anyone have any information? Me too!!! I am now 46 and had a lifetime of complications from my mother having an ether and forcep birth…. they ripped me out of her womb and stuffed her with gauze because she wouldn’t stop bleeding. I have suffered from MANY miscarriages and been misdiagnosed with bi-polar at the age of 36…smh. They (doctors) don’t like conflict even if they didn’t cause it, so they call it something else, and don’t really care. I can’t list the issues I have had and continue to have and am doing more research to find others who experienced these things. I still have the mark of the forceps behind my ear and I have had spinal issues for the past 20 years. Now, my finger and thumb goes numb and tingles and sharp pains up my arm from clavical nerve damage, which they re-(mis) diagnose as an arm sprain…..smh I could go on for days, including the lucid dreams and spooky stuff that goes on with my perception.I too had a million and one jobs throughout my life and am currently writing a book about this to bring it to light. My grandmother gave birth in a private nursing home in Dundee (Scotland) five times between 1926 and 1933: how many of these births were under Twilight Sleep, I don’t know, but my mother (born 1926) told me Granny went to that home specifically for that treatment. It seemed to be a choice which privilege could buy, as my own mother went on to have my sister and me in 1958 and 1961 in a colonial hospital in East Africa under Twilight Sleep, too. I used to ask her about our births when I was very little and remember the title ‘Twilight Sleep’ as if it were a scary story, backed up her expressing how weird and alienated she had felt – ‘they brought you to me and I said, that’s not my baby’ – and the difficulties she had breastfeeding. It breaks my heart . I was always determined to have a natural childbirth if and when my time came, and was very lucky to be able to have one. But yes, Twilight Sleep was on offer to women in the UK, and in the British Empire of the time, but perhaps only to (financially) privileged women…. When I was born, I was born through a twilight birth. My mother was put to “sleep” when she was having labor pains and I was forcibly removed with forceps. I was most likely born with breathing problems/comatosed and knocked out from the morphine and scopolamine. I am in my 40’s now and I still have not recovered. Your advertisement on this page covers the left side of the page and won’t go away. We had some coding issues – this has now been fixed! Apologies for the inconvenience. My mother had twightlight sleep at least for the birth of my sister. I remember her telling me that after Irving birth she would ask the nurses if she had a boy or a girl and before they could answer her she would lose consciousness. What a terrible experience to go thru. By the time I had my babies in the early 80’s til late 80’s. I had mine natural and breastfeed all 3. I remember hoe worried she was that I wasn’t going to have any medication and since she bottle fed all of my brothers and sister, she had worries about that also. When I had my daughter in 1969, this is what happened. I remember trying to get out of the crib because I thought I had to go to the bathroom. I know I cried at some point and was very embarrassed afterwards. I also wasn’t able be bear down because I was so messed up. According to the doctor, had I been able to do this the baby would have been born an hour sooner. At that time, they would give you the gas when the head was crowning. For three days afterwards, I had debilitating migraines. According to my sister who is an obstetric nurse the twilight sleep consisted of demoralized and scopalomine and that it was probably the latter that caused my migraines. I had my son in Cleveland Clinic. Big name hospital. I was in labor for 18 hours before they gave me some pain med. I slept some and cried and was hysterical at other times. I cried that it was my turn to have the baby. I’ve been here the longest. They tried to calm me and a fell asleep again. I do not remember giving birth to my son. I had night terrors of labor for years. I had only one child. I could not imagine going threw that again. I had no instructions on breast feeding but tried anyway. It was very painful and the baby was always hungry. I gave him formula in-between times and after 4 months stopped. The how experience was bad. I had three of my children under twilight sleep. My first child’s birth was the worst. I was on and out of awareness. I could not control my self in any way I remember the pain, nurses laughing at me and horrifying things happening to me. After it was over I tried to tell my Doctor that I could remember a lot of my labor. He just laughed and said that was impossible. I suffered post traumatic stress disorder (it wasn’t called that back then) I had so many of the symptoms with night terrors, depression and flash backs. The worst was that I had no recognition of my baby. Nothing! He was a complete stranger to me. I had to learn to love him. Such a sad time. was there. Those 2 babies are in their late 50s now, have been brilliant students and have never had any problems. Neither have I.
I asked for it with my next baby and the Dr. (different city) wouldn’t give it to me. I had an epidural which I hated. I hated that helpless heavy feeling from the waist down. When I asked my mother about my birth, she told me “I don’t remember I was in a twilight sleep”. who gave birth under this potent narcotic cocktail This article is very illuminating, because it gives detail about what the delivery was like for women who used this method, and it sounds like a nightmare. her in all the ways that she did love and take care of me. I was born under twilight in the 1950’s. I was 4 pounds 5 ounces, drugged by the twilight and the umbilical cord was around my neck. It’s a wonder I didn’t die. I had my third baby under demerol and scope in 1969 after having 2 in a military hospital which were nightmares. I have no memory of the birth and woke up 5 hours later to find a nurse sitting beside me holding him so he would be the first thing I saw waking up. My baby was absolutely perfect with no marks on him and I required not one stitch and had no pain. I was told I was so tired by the time I went into labor that just a small amount of medication knocked me out and I just relaxed and pushed him out. Not a mark on either one of us so I would never condemn it. He is now 49 and as normal as his siblings. It was nice to not have stitches to heal and be able to go home and take care of the rest of my children….who were forceps delivered and bruised. I was born in 1978 and I think this was how my brother (born in 1970) and I were delivered. My mother said that she has no memory of our births. She said her doctor asked her if she was tired because she was still working up to the day she had each of us ( she was a teacher). She told him that she was and he told her he was going to let her rest. When she woke up we were born and the nurse brought her her baby. This happened each time. We turned out fine, but it is disturbing to think that you dont know how your babies were born. I haven’t been able to have more children due to the night terrors experienced with my first, sounds selfish but when you think your dying I couldn’t go through that again. Forgot to mention I was cut beforehand and tried with forceps, suction and a surgeon trying to twist her head but heard ‘if I carry on I will break the neck’!!! It seems even in today’s world childbirth is still looked upon as ‘ordinary’ when in fact it is the most extraordinary and petrifying experience you can go through. Hats off to the women who have good memories of their childbirth.